According to the Airline Reporting Corporation, for all three quarters to date of 2012, Mega Agencies have issued 25% of the domestic airline tickets issued by the agency community. The Online Travel Agencies (OTAs) grew as a percentage of total transactions (42%) in the 2nd quarter, but reverted back to 41% of total agency sales in the 3rd quarter. The number of tickets issued by all other travel agencies in the US grew to 34% of total in the 3rd quarter, after a slight dip in the 2nd quarter. 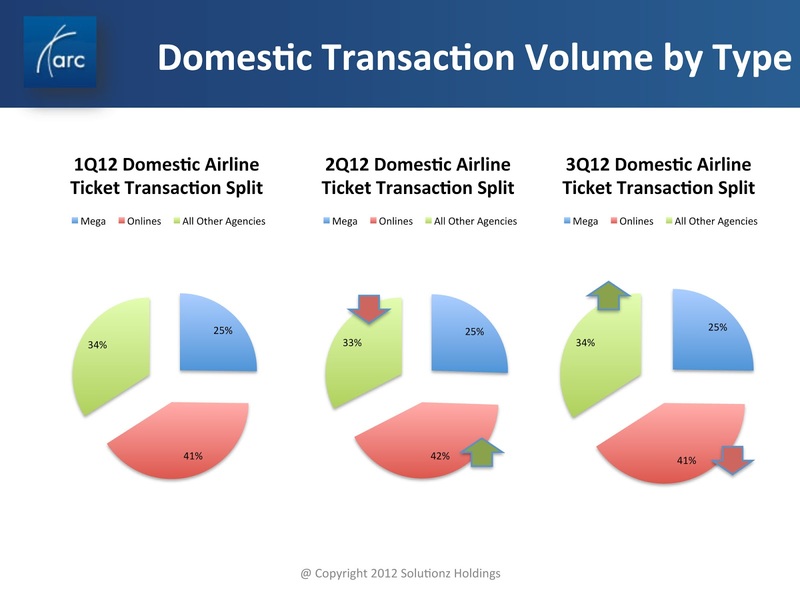 This is the second in a series of blogs this week about the 3Q2012 Airline Reporting Corporation statistics. Today's topic is the average value of an international airline ticket. This graphic tells several stories. First, it shows that quarter over quarter, for the first quarter all channels were up as it relates to the average value of an international ticket. 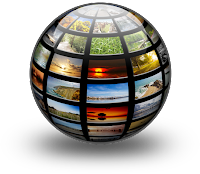 In the second quarter, the travel agent channel (both mega and other) were down, with only the OTAs showing an increase. 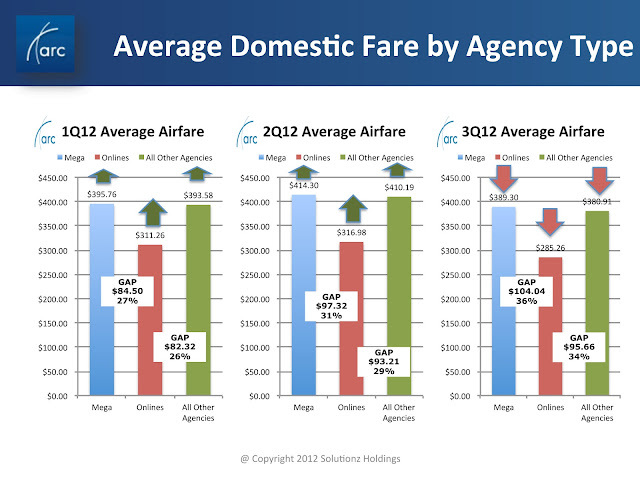 but in the third quarter, in all three categories, fares were down. Like domestic ticket pricing, this is good for consumers, bad for the industry. In the third quarter, the average value for mega agencies was down 3% from $1,539.76 to $1,487.15. For online agencies it was down 10% from $551.14 to $495.62 and for all other agencies, it was down 5% from $769.75 to 732.30. With online having the greatest decline, you can be fairly certain that the airline's own average for sales over their website are following that same trend. This is born out by a simple search on Kayak for just about any city pair -- the airline price is as low or lower than the online travel agency price. So if you are an airline and you are trying to shift international travelers from a travel agency to your own website, I have just one word for you - STOP. Second and most important in this analysis is the gap between the Mega agency and online and the gap between all other agencies and online. This is the critical issue when looking at the value of each channel for the airlines. 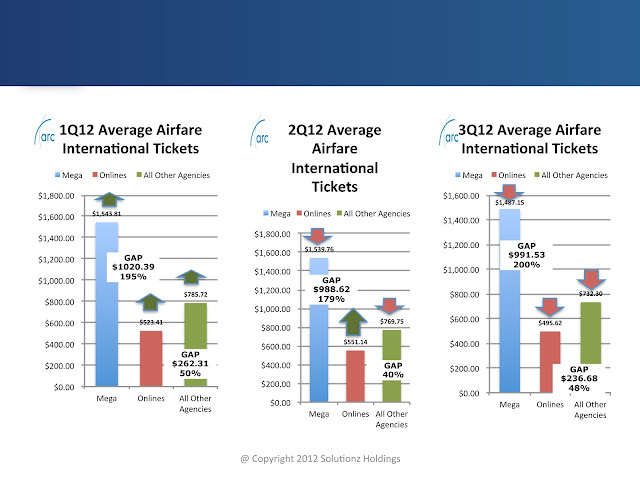 In 3Q2012, the Mega agencies produced an average ticket that was an astounding 200% higher than the online channel. This $991.53 is sure to cover any commissions/volume overrides and the GDS booking fee. On average, the total of these two items on a $1,487.15 ticket would be no more than $164.71 (assuming a 10% payment to the agency and a $16.00 GDS booking fee). That leaves $826.82 of profit for the airline on top of the fare that they would have earned by selling on their own website. In the same quarter, the gap for the other agencies over online was $236.68, a 48% gap. Using the same calculation methodology, that leaves $147.45 in profit for the airline. Tomorrow we'll look at percentage of domestic business coming through each of the channels, then on Thursday, we'll look at the international business mix. Airline fees (aka ancillary fees) sold by the travel agency industry are up 63.17 year over year. Taxes are up just 6.49%. The last time that the number of agencies was this low was 1977. In 1977, those agencies produced just $9.3b in air ticket sales. At that time, the industry was just about to be changed forever by both deregulation and the advent of the Central Reservation System on the travel agency desktop. The availability of such technology to improve accessibility of information, as well as productivity has been a boon to the industry for nearly 35 years. The number of travel agencies in the US hit a high of 47,286 in 1996 and have been declining annually since then. 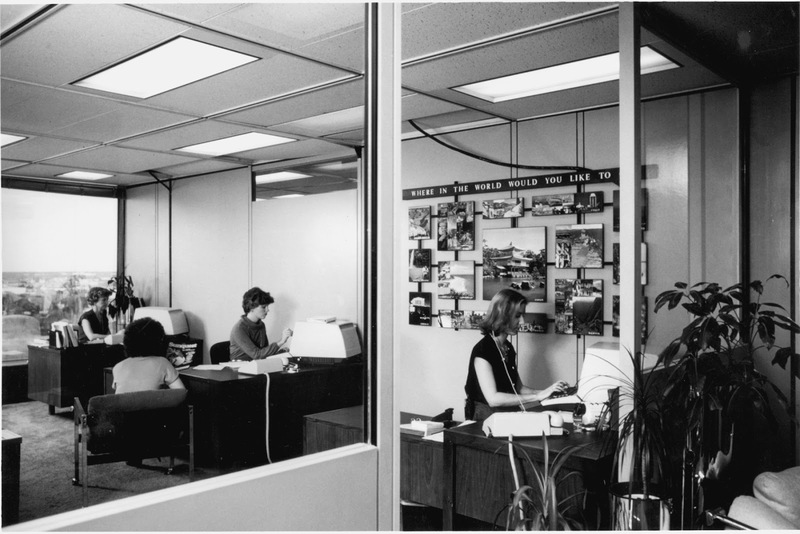 Although it would appear that we are declining as an industry, times have actually changed for the better and overall on average, the remaining agencies are bigger and stronger than their 1977 predecessors. 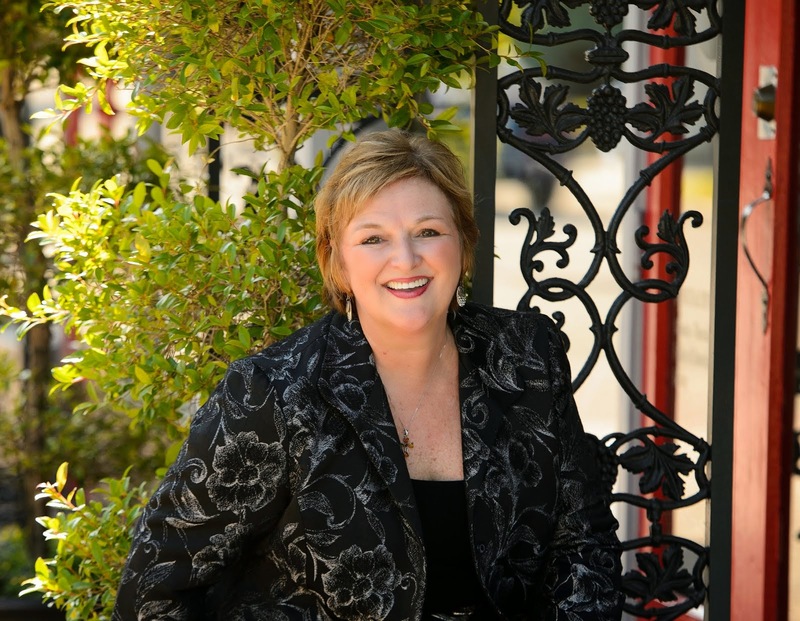 Today's ARC agencies are split into three major groups - first is the Mega Agencies, which includes American Express, CWT, BCD, HRG, Maritz, Omega, CWT/SATO and SATO. These mega agency groups were largely a product of the rollup of smaller regional agencies and acquisition. The second category are the balance of the brick and mortar agencies. 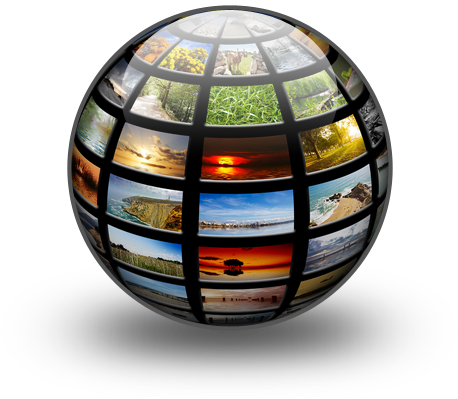 The last category are the Online Travel Agents. The primary OTAs include Expedia, Priceline, Orbitz and Travelocity and their sub-brands. 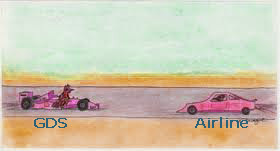 As the GDS/Airline battle is being waged in a courtroom in a state district court in Texas, I'd like to take this opportunity to put to rest the discussion about the profitability of airline direct versus the GDS driven agency channel. 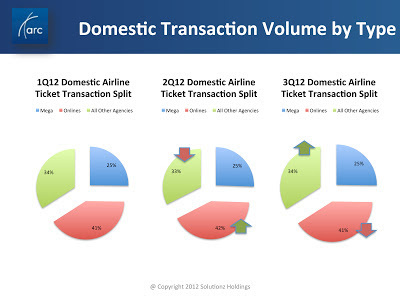 This is the first in a series of blogs this week about the 3Q2012 Airlines Reporting Corporation statistics. And unlike survey data which can be seen as suspect, depending on who is procuring the study and how many are in the sample, this is actual transactional data and it is current through the end of September 2012. For a number of years now, I have been providing an assessment of the travel agency channel as it relates to the sale of airline tickets. The Airlines Reporting Corporation is gracious in providing market segment data for this analysis. They play a critical role in our industry, settling the bulk of airline tickets sold in this country by the agency community, including both traditional and online agencies. And while there are some agencies that bypass the GDS for some portion of their airline business, the bulk of ARC transactions do indeed get sold via one of the three major GDS companies (Amadeus, Sabre or Travelport - with their Apollo, Galileo and Worldspan products). First, it shows that quarter over quarter, for the first two quarters of the year, the average price of an airline ticket sold through Mega agencies, Online agencies and all other agencies (13,709 agencies all told), was up, but in the third quarter, in all three categories, fares were down. This is good for consumers, bad for the industry. The average value for mega agencies was down 6% from $414.30 to $389.30. For online agencies it was down 10% from $316.98 to $285.26 and for all other agencies, it was down 7% from $410.19 to 380.91. 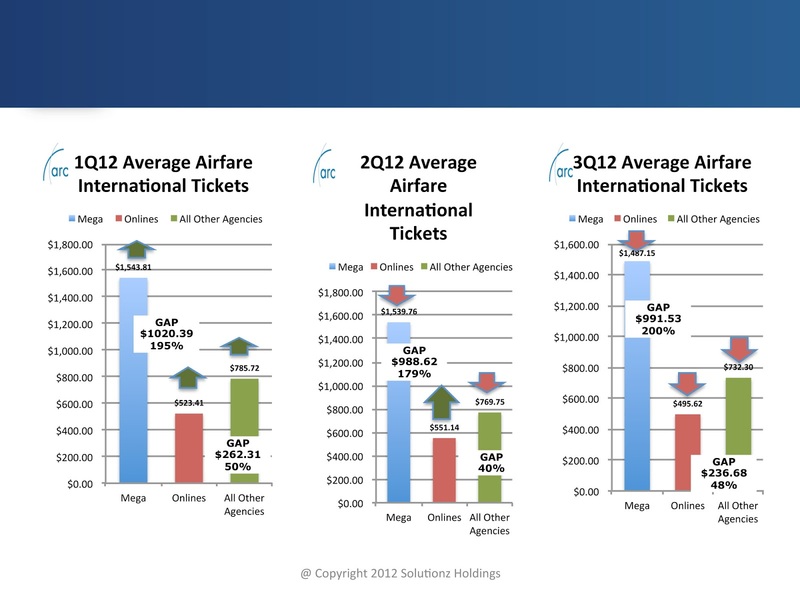 In 3Q2012, the Mega agencies produced an average ticket that was a whopping 36% higher than the online channel. This $104.04 of course must still cover any commissions/volume overrides and the GDS booking fee. But on average, the total of these two items on a $389.30 ticket would be no more than $54.93 (assuming a 10% payment to the agency and a $16.00 GDS booking fee). That leaves $49.11 of profit for the airline on top of the fare that they would have earned by selling on their own website. In the same quarter, the gap for the other agencies over online was $95.66, a 34% gap. Using the same calculation methodology, that leaves $41.56 in profit for the airline. Someone will have to explain to me why that is not appealing. I have yet to hear a convincing argument. Lastly, look at the trend over the three quarters. The gap is getting larger, not smaller. Now before you get riled up, I want to go on record that I fully support the airlines using newer technologies, such as Farelogix and GDSx, to enable smarter distribution of the airline's full range of products. But I am once again reaching out and appealing to the airlines not to throw out the baby with the bathwater, because you think that the agency channel, [or more succinctly, the GDSs that currently aggregate this high value demand] is no longer viable. Look at the numbers one more time and then take a look at the Pegasus model that has been deployed successfully in the hospitality industry to tap into the existing distribution structure. I believe this could be the right model for the airline industry moving forward. Tomorrow we'll look at the same set of data for the international tickets sold by US ARC agencies.